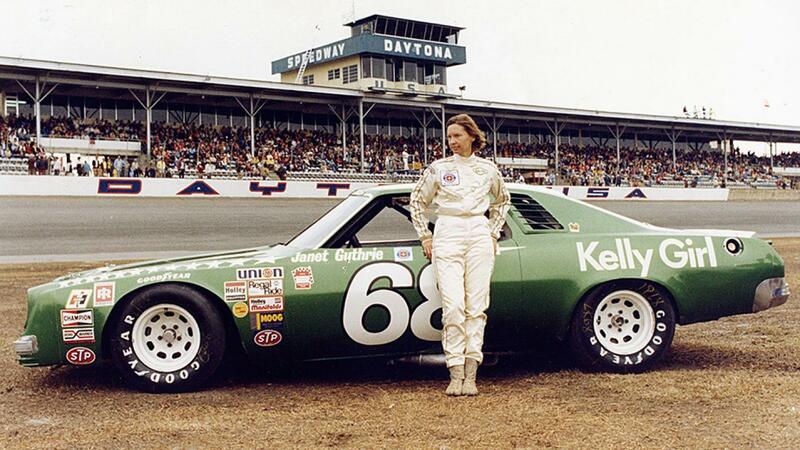 Motorsports isn't typically my jam but if Janet Guthrie were still on the scene, I'd become a quick enthusiast. Like Diana Kennedy, Guthrie was ahead of her time. She pursued her passion with tenacity, ignored the naysayers, and broke down barriers in a ridiculously male-dominated sport. She is inspiring as hell and her story is one that everyone should hear. This film is a typical sports documentary (meant with zero insult). It's well-produced, easy-to-follow, and suitable for racing noobs and enthusiasts. As a newcomer to the sport, there were some aspects of the process that I didn't 100% understand but that lack of knowledge didn't impact my overall enjoyment. I walked away after the credits rolled feeling proud of Guthrie and pissed off that the world is such a wretched place for women. This collage of negative headlines about Guthrie makes my blood boil. My first inclination is to suggest that you watch "Qualified" the next time you need a reminder that women can do anything; however, that might not be the move. Yes, Guthrie defies all odds and fights her way to the Indy 500 but she's ultimately barred from doing what she loves because of misogyny. I guess the right time to watch is when you need a boost of confidence coupled with a shot of cynicism that will remind you to never stop fighting. The situation is still grim even though we've made progress since Guthrie's career ended in 1980. Don't watch "Qualified" after a horrible day at work where a douchey backend developer not-so-subtly implies that you are a moron who is incapable of doing her job; it might set you over the edge and cause you to commit fireable offenses. ESPN will debut this movie at part of their "30 for 30" series on September 10. Watch when it premieres on ESPN or wait 20 days and catch it streaming on ESPN+ (you can sign up for a free trial account). 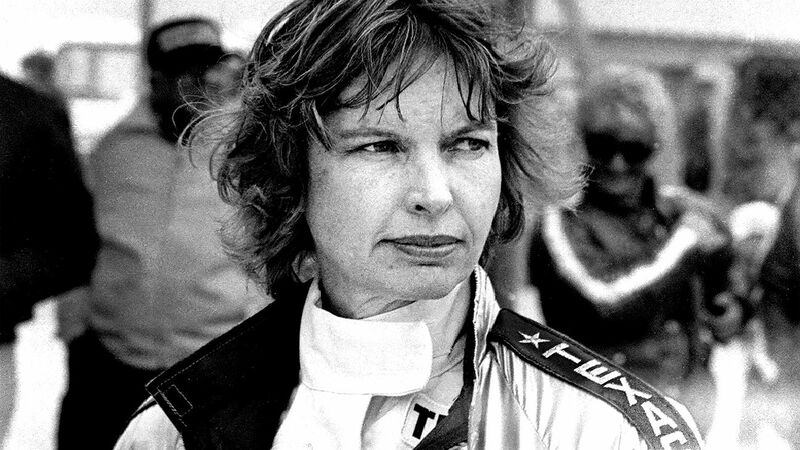 In 1977 Janet Guthrie was the first woman to qualify for and race in the Indy 500. In 1980, she begrudgingly retired. Despite her immense talent, the sponsorship money wasn't there and although she loved the sport, she had no other options. Her story is equal parts inspiring and infuriating. I forget who she was talking about (Pat Patrick?) but Guthrie described someone as having "all the human warmth of a jackhammer." I love this description. After I met up with director Jenna Ricker and producer Caroline Waterlow (who won an Oscar for "O.J. : Made in America), I spent the morning fantasizing about quitting my job and doing something more adventurous. Guthrie took chances all the time and there I was, afraid to ride one of those electric Bird scooters a few miles from my Airbnb to downtown Austin. After watching so many films about badass women and talking to those behind the camera, I am beyond inspired and determined to take more risks in my own life and career. From l to r: Nina Krstic (producer), Waterlow, Guthrie, Ricker, and Greg Stuhr (producer). WiR: Jenna, you have a background in narrative filmmaking. 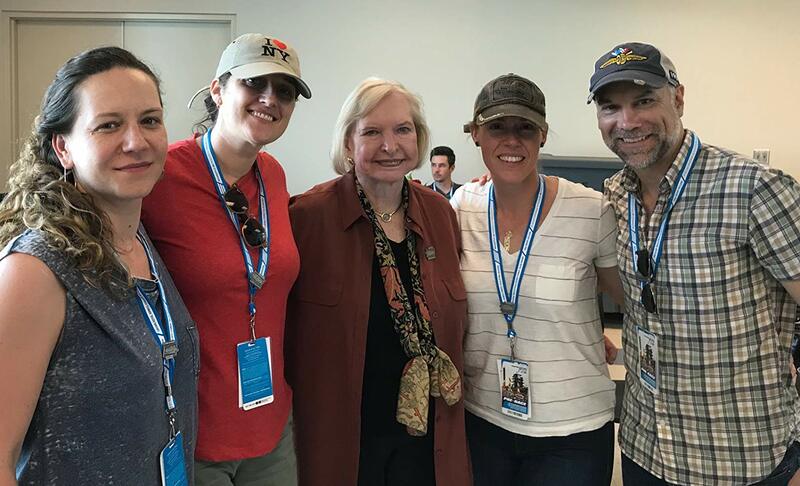 What made you want to get into documentary and why did you want to focus specifically on Janet Guthrie? JR: I think Janet's story is what led me into documentary. I was handed her book by one of our producers and I devoured it; she's a really great writer. It was such a good story but so much story that you could see both a documentary and a narrative being made out of it. I felt like it would be best-served by getting a bunch of different voices in the mix and hearing about her experience firsthand. I had this relationship with Caroline Waterlow and our other producer, Nina Krstic, who had been doing some sports docs. After discussing it with them, I knew that we needed to make this documentary. CW: As a producer in docs, I think we're always trying to elevate the medium. We're in such an amazing time right now where people are allowed to try so many different things ... we're in this crossover phase. I loved the idea of Jenna's film and wanted to help get it into the world. I felt like Jenna's narrative skills would really bring drama to this story. Like yeah, we can throw some archival footage together, but we need someone to craft the ups and downs. Bringing that narrative background to doc really elevates the whole process. Docs are tough. You find this great person with an amazing life story, but how do you structure the film in a way that does it justice? JR: We had a lot of conversations about that. The height of her professional racing career spanned a small period, so we thought ... how do we do this? Do we go back-and-forth in time? The story kind of bore out itself and showed us the way it needed to be told, so that we could feel the big highs and then the rug as its ripped out from under her. Going in, we thought that it wouldn't necessarily be linear but as the story progressed, we realized that we needed to do it chronologically for it to resonate. CW: In a weird way, the fact that she has 3 intense years, particularly with Indy, works so well as a focus and gives a clear way to frame the story. At 38, she does this amazing thing and it's like ... thank you! I can change my life at 38. Take a note from this lady – it's never too late to shake things up. I found myself wondering about Janet's life after racing ... is she married, does she have kids? Of course, none of that is necessary information and people can easily Google if they're really interested, but how do you decide what to include and what to leave out? JR: There was a fair amount of amazing stuff that we had to decide on. Coming from narrative, where you pre-structure the film with a script, it was tough for me to make cuts. Some of those choices were easier than others. She wasn't married at the time and didn't have kids, so we didn't feel the need to include those facts ... if she isn't doing something, we don't need to highlight it. There were also a couple of times where we needed to check in with ourselves and figure out if we were asking these questions only because she's a woman. No one is stopping a male athlete at the height of his career and saying, "Tell me about your wife and kids." JR: Yeah, exactly. It did dance across our awareness, though. CW: If we were doing an extended version, maybe that would have found its way into the story but it wasn't part of her life during the time period that we were focused on. She did marry later in life but did not have kids, just FYI. I'm mainly curious about the personal stuff because I'm constantly looking for childless female role models. I just watched a doc about Diana Kennedy where she talks very frankly about never wanting children ... and she was born in the 1920s! I found that very inspiring and saw some similarities between her personality and Janet's. They're both very to the point and scientific in the way they communicate. CW: I'm dying to see that movie. JR: There's this convergence of the era in which she was raised and her profession. Think of our grandparents ... they weren't talking about their emotions; they didn't have therapists. Swallow it down, do not talk about it, you know? Janet grew up in a very academic family and a time when problems were intellectualized but not felt. The other part of it is the personality of a race car driver. They're risk calculators. Things become very much black and white. CW: They have to compartmentalize and narrow their focus because it's necessary to get the job done. JR: There were moments when she explained things to us and we were all emotional about it but she wasn't at all. Also, it's not like these events just took place for her ... she had some level of removal from them. CW: She's had time to process and has written a book. The look of single-minded determination. She expresses disappointment over how things shook out but she doesn't seem bitter or even regretful. JR: Her attitude is kind of just like ... it's impossible to change the past. CW: One of the things we're always dealing with, especially in a sports doc like this, is that Janet doesn't experience an obvious win but she does so well. The idea of the ripple effect is really cool. She didn't change the game forever but she makes her dent in it and convinces a lot of men to change their minds. You never know what the impact is going to be in the moment. JR: We spoke with Pam Mooney's [Guthrie's friend] daughter-in-law who grew up in Indianapolis and said she dressed up as Janet for Halloween one year. In the late 70s, early 80s that was not uncommon! This is a piece of women's history that is kind of lost. 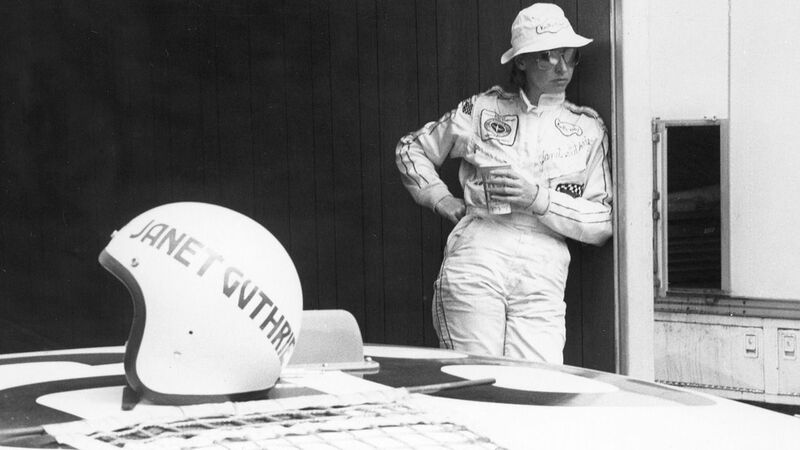 She was on the news all the time during that period and was a huge deal but now we're all like, "Who's Janet Guthrie?" CW: Any time we described this film to someone they thought we were talking about Danica Patrick. We had to explain that no, there were several female race car drivers that came before her. Prior to watching this film, Danica Patrick was the only female driver I could name! I also know nothing about the sport or the rules of racing. How did you decide how much context a viewer like me would need to understand the world of the film? JR: We looked at some of the sports films that we love for guidance. For example, I love "Senna" (2010) but I can't tell you how Formula 1 regulations work. What I know is that it's a very political process, there's a lot of money involved ... the basics. We had those conversations a lot and were lucky to have plenty of good people to act as sounding boards. I hope we gave viewers enough information to keep them invested in her story and the stakes without overloading them with rules and regulations. CW: My husband [Wyatt Smith] is an editor who works on Marvel movies and I was talking to him about this. How do you explain all the rules of the universe? Sometimes you can't and it has to be simplified, like this is a power that someone has ... just go with it! You can easily fall down a rabbit hole of too much detail and it helps to draw a line. Most viewers probably find Guthrie more interesting than the minutiae. I hate to bring the way she looks into this but she's a total babe! She's brilliant, a complete gearhead, and surprisingly, pretty egoless. She talks multiple times about how much she appreciates her team. CW: When was the last time you heard a male athlete go on about the team? JR: She had an opportunity that on paper, looked really great. She could have moved on to a bigger and better team. The truth of it is that she would have just been there to serve the better drivers ... that's how the bigger teams work. I once asked her if she regretted her decision and she said, "Never." CW: They had no loyalty to her. What would have happened had she lost one race? 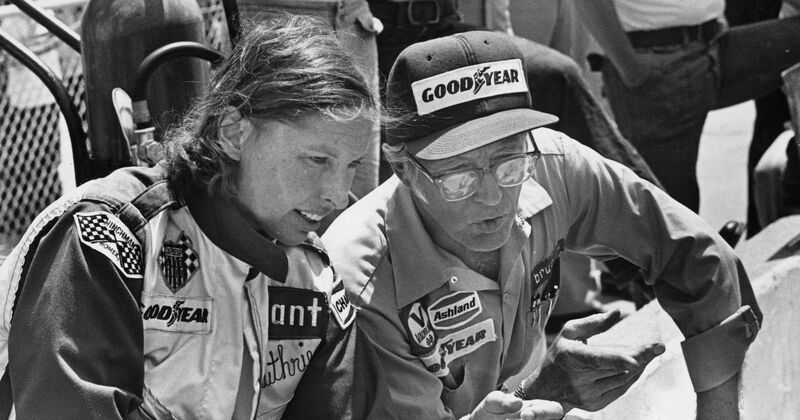 Guthrie with her team owner, Rolla Vollstedt. JR: Her background is fascinating to me. She went to school and studied to become an aeronautical engineer. She loved cars and decided to learn how to build her own engines using the European manual for Jaguar in the middle of the night, in a cold garage. Her family kept asking when she was going to get her master's degree but she kept delaying it because she wanted to put all of her extra money toward racing. There's nobody ahead of her telling her that it's possible to become a professional in the field. She just knew herself and what was right for her and pushed to make it happen. I envy people who have clear goals and desires. I'm not saying that single-mindedness makes their lives easy, but it does simplify some things. Those people don't spend sleepless nights wondering what it is that they're supposed to do because they already know. CW: As a person who makes documentaries, I'm super attracted to people like that ... they make great stories. And I want to be like that! I wish I could spend all of my money doing one thing and be cool with it. There are all of these little nuggets that Guthrie drops so casually. She initially wanted to be a pilot but that career was stalled because she couldn't fly for a commercial airline or the military [women were barred until the 1970s]. She also applied to NASA when they were starting to take female scientists but got rejected because she didn't have a Ph.D. Neil Armstrong doesn't even have a Ph.D. but okay. There were a ton of things that she wanted to do but couldn't. JR: She has a line in the film that's like, "If I got this opportunity because I'm a woman, fine. There were many more opportunities that I didn't get because I'm a woman." The Kelly Girl Laguna wasn't exactly an amazing car. I asked Elizabeth Carroll, the director of the film about Diana Kennedy, this same question: do you think Janet would identify as a feminist? JR: I think she would now. Her friend, Pam Mooney, and Arlene Hiss [also a race car driver] probably all would. They didn't necessarily know it at the time, but they came to own it when they realized how much they deserved a seat at the table. There was a shift in mindset, for sure. One of the things to note about Janet is that she had no desire to be a pioneer, she just wanted to race cars. But little girls looked up to her and she kind of got thrust into that role unwittingly. She took on the responsibility, though. It's pretty impressive for a shy person! I'm an introvert and the idea of somehow becoming a public figure makes me feel a little bit panicky. I'm impressed that she was able to pull it together. JR: I think it weighed on her a great deal. She would come home and her family would ask her about things that they saw on the news. CW: A lot of people have wanted to make films about her. Me, Jenna, and Nina became friends with her and convinced her that we were the best people to do it. I think that was part of her interest in it. She doesn't necessarily want to share private parts of her life with other people but she does it because she understands the importance. If someone is inspired by it, then it's all worth it. "Qualified" is one of the best films that I saw at SXSW. I felt spiritually connected to Guthrie, a person who I am nearly positive is also an INFJ and found her incredibly inspiring. Ricker tells a great story that will piss you off and hopefully move you to action. If someone tells you that you that your goals are impossible because of a dumb reason, take a note out of Guthrie's book: pay them zero mind and keep doing what you love. If you want to keep up with news about "Qualified," follow 30 for 30 on Twitter and don't forget to mark you calendar for September 10.